We report on an infant who presented with UTI who was discovered incidentally to have a large left-sided suprarenal hematoma. The mass resolved spontaneously with no complications. We discuss the diagnosis and management of the infantile suprarenal mass and explain the link between the NAH and UTI in this child. A 4-week-old Saudi boy was referred to our hospital with fever, vomiting and painful micturation for three days. He was born at term by spontaneous vaginal delivery following unevent­ful pregnancy and required no resuscitation at birth. His birth weight was 3 kg and he had no neonatal problems. A routine fetal scan at 20 weeks of gestation was reported as normal. He was given vitamin K routinely at birth and there was no history of trauma. There was no family history of bleeding disorders. On exa­mination, he was well and thriving, with height and length on the 25 th percentile. His temperature was 38.2°C and his other vital signs were within normal range. Systemic exa­mination revealed no significant findings; in particular, he had no palpable mass or organo­megaly and his genitalia were normal. His urine was positive for nitrate and leukocytes but negative for blood and protein. His hemo­globin, white cell count, platelets, urea, crea­tinine and electrolytes were all within normal range. He was commenced on intravenous (IV) antibiotics for suspected UTI after collec­ting urine and blood samples for cultures and sensitivity. The diagnosis of UTI was confirmed with positive urine culture for E. coli. Routine abdominal and pelvic ultrasound scan (USS) was performed prior to discharge, which iden­tified a large, round, well-circumscribed, thick-walled, left-sided suprarenal mass of 4.5 cm × 4.7 cm of mixed multilobulated echogenic pat­tern consistent with adrenal hematoma [Figure 1]a. The mass was compressing the upper pole of the left kidney with normal looking dis­placed spleen. The right adrenal gland and the kidney were both normal. Color Doppler USS of the mass confirmed that it was avascular [Figure 1]b. A computerized tomography (CT) scan of the abdomen with IV contrast con­firmed the left adrenal gland origin of the mass and excluded the periadrenal hemorrhage [Figure 2]a and b. 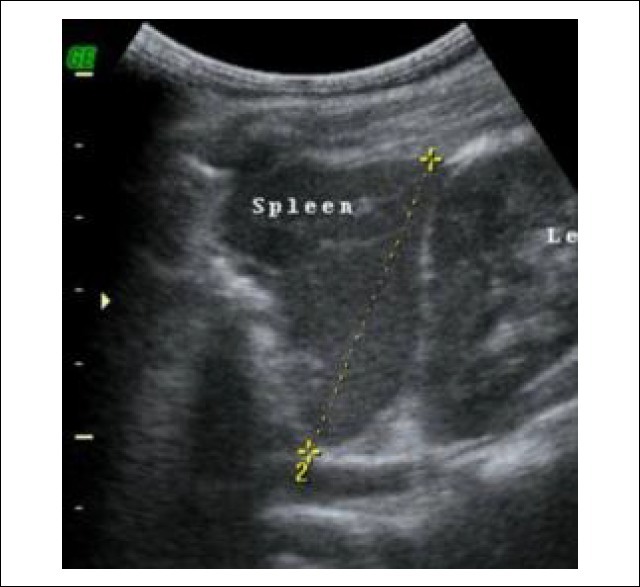 Figure 1: Abdominal ultrasound of left adrenal hematoma showing a large, well-circumscribed suprarenal mass of heterogeneous echogenic pattern measuring 4.5 cm × 4.7 cm compressing the left kidney (a) and color Doppler showing the avascular nature of the mass (b). Figure 2: CT scan of the abdomen with intravenous contrast: (a) the mass arising from the adrenal gland with no contrast uptake or periadrenal haemorrhage, (b) a reconstructed CT showing the compression of the upper pole of left kidney with upward displacement of the spleen caused by the large hematoma. The cleavage line around the mass indicates that it is well separated from the kidney, spleen and spine. Further investigations revealed that an early morning Cortisol blood level of 432 nmol/L (170-550), adrenocorticotropic hormone (ACTH) level of 43 pg/mL (20-80), normal coagulation profile (INR = 1.1) and urinary catecholamine metabolites. A repeated USS two weeks later showed a reduction of the size of the mass. Serial follow-up USS were arranged for the child; however, he was brought to the hospital only seven months later and the USS of the abdomen at that time showed com­plete resolution of the mass with normal-looking kidneys [Figure 3]. The child was thriving and well and the family reported no symptoms of UTI. Figure 3: Follow-up USS 7 months later showing no mass between the spleen and the left kidney, confirming the complete resolution of the hematoma. The primary task is to identify the conditions that can resolve spontaneously such as the NAH and congenital neuroblastoma stage IV-S from those requiring surgical intervention. This can be achieved by a combination of clin­ical, laboratory and radiological evaluations using USS, computed tomography (CT) scan and magnetic resonance imaging (MRI). In difficult cases, biopsy or surgical resection may be contemplated to clarify the nature of the mass. The history of traumatic delivery, birth asphyxia or sepsis in a child with hypo­volemia, anemia, jaundice, bleeding disorders or scrotal hematoma are usually suggestive of the NAH, whereas hypertension and high uri­nary catecholamines are diagnostic of neuro­blastomas. The large size of the adrenal gland in neo­nates enables the USS to be a powerful diag­nostic tool to identify the adrenal gland patho­logy in this age group. , It can define the shape and the echogenic pattern of the hema­toma at the different stages and the serial USS measurements can confirm the change in size across time. The color Doppler and/or the power Doppler USS are helpful to confirm the avascular nature of the hematoma, which can differentiate it from other vascular anomalies such as hemangiomas or pulmonary seques­trations. Sometimes, early hematomas can mimic neuroblastomas on USS; however, when the latter is highly suggested, methyl-iodobenzyl-guanidine (MIBG) scintography can be helpful. When a child does not have symptoms rela­ted to the hematoma with normal laboratory tests, further imaging may be needed. The CT scan is particularly helpful in the diagnosis of non-adrenal masses such as extralobar pul­monary sequestrations and defines the extent of neuroblastomas and adrenal hemorrhage. The MRI is useful for further characterization of other pathologies , such as bronchogenic cysts, teratomas and in the pre-operative assessment of neuroblastomas. In our patient, the USS was very useful. The initial scan suggested that the mass originated from the left adrenal gland and had the mixed echogenic pattern of a subacute hematoma. The follow-up USS confirmed a reduction in the size of the mass as typically seen in hema­toma. We performed the CT scan to rule out other pathologies. Our patient presented with UTI, which to our knowledge has not been reported in associa­tion with the NAH. Although it is possible that the presence of NAH and UTI was a coin­cident, it is more likely that they were related. Our child had no congenital anomalies in the urinary tract that could predispose to UTI. Accordingly, we speculate that the pressure effect of the adrenal hematoma on the kidney was a risk factor for this child's UTI. The distortion of the upper pole of left kidney by the hematoma as shown in [Figure 2] can lead to a stagnation of the urine in the upper calyces and the persistent pressure effect of the mass could damage the anti-reflux mechanism of the papillae leading to calico-tubular backflow (intra-renal reflux). The combination of these factors can predispose to pyelnephritis, parti­cularly in small infants. There was no hydro-nephrosis or dilatation of the renal pelvis on the USS, probably because the mass did not cause a complete obstruction of the pelvo-uteteric junction. The majority of reported infants with NAH presented during the early neonatal period with clinical evidence of hemorrhage ,,,, or were detected on the antenatal USS. However, our patient presented relatively late and had no signs of shock despite having a large bleeding as indicated by the size of the hematoma. This is probably because the hemorrhage was insi­dious and was contained within the adrenal gland's capsule. He had no bleeding disorders or risk factors for the NAH, indicating that it can develop spontaneously in full-term babies. In conclusion, this case illustrated that massive adrenal hematoma can develop in small infants and resolve later spontaneously. It also sug­gests that large adrenal hematoma can be added to the risk factors for neonatal UTI. 1. Flee Z. Ultrasound in screening for neonatal adrenal hemorrhage. Am J Perinatol 1995;12: 363-6. 2. Ruminska M, Welc-Dobies J, Fange M, Maciejewska J, Pyrzak B, Brzewski M. Adrenal haemorrhage in neonates: Risk factors and diagnostic and clinical procedure. Med Wieku Rozwol 2008;12:457-62. 3. Black J, Williams DF Natural history of adrenal haemorrhage in the newborn. Arch Dis Child 1973;48:183-90. 4. Scott EM, Thomas A, McCarrigle HH, Fachelin GC. Serial adrenal ultrasonography in normal neonates. J Ultrasound Med 1990;9:279-83. 5. Velaphi SC, Perlman JM. Neonatal adrenal haemorrhage: Clinical and abdominal sonogra­phic findings. Clin Pediatr (Phila) 2001;40: 545-8. 6. Avolio F, Fusillo M, Ferrari G, Chiara A, Bragheri R. Neonatal adrenal hemorrhage manifesting as acute scrotum: Timely diag­nosis prevents unnecessary surgery. Urology 2002;59:601. 7. Sauvat F, Samacki S, Brisse H, et al. Outcome of suprarenal localized masses diagnosed during perinatal period. Cancer 2002;94:2474-80. 8. Oguzkurt P, Ince E, Temiz A, Demir S, Akabolat F, Hicsonmez A. Prenatal diagnosis of a mass in the adrenal region that proved to be a teratoma. J Pediatr Hematol Oncol 2009;31: 350-1. 9. SlovisTL in Caffey's Pediatric Diagnostic Imaging. 11 th ed. Philadelphia, PA: Mosby; 2008. 10. Kawashima A, Sandler CM, Takabashi N, et al. Imaging of nontraumatic hemorrhage of the adrenal gland. Radiographics l999;19:949-63. 11. Deeg KH, Bettendorf U, Hofmann V. Diffe­rential diagnosis of neonatal adrenal haemor-rhage and congenital neuroblastoma by colour Doppler sonography and power doppler sono­graphy. Eur J Pediatr 1998;157:294-7. 12. Abdu AT, Kriss VM, Bada HS, Reynold EW. Adrenal hemorrhage in a newborn. Am J Perinatal 2009;26:553-7. 13. Katar S, Oztürkmen-Akay H, Devecioğlu C, Taºkesen M. A rare cause of hyperbilirubinaemia in a newborn: Bilateral adrenal hema-toma. Turk J Pediatr 2008;50:485-7. 14. Kirby CP, Davidson PM. Inguinoscrotal bruising: A sign of neonatal adrenal hemorrhage. Pediatr EmergCare2000;16:179.